The BRICS summit becomes an occasion for India’s foreign policy and diplomacy to rise above the mundane and cast a glance at the horizon and at the vast vista of the emerging world order. Through the past two-decade period of “adjustment” to the post-Cold War era, India largely withdrew from the international arena. Many distortions crept in. India could not foresee the return of Russia to the world stage as a major player. Pundits even wrote off Russia as an inconsequential world power and urged India to look beyond the Rubicon and align with the United States. They wouldn’t even want to contemplate the disturbing thought that the United States was in inexorable decline and its preeminence as the “sole superpower” would be increasingly under challenge in a multi-polar world. The high water mark was reached with the conclusion of the US-India civil nuclear agreement in 2008. If one were to go through the media commentaries at that time or the debates in the Indian parliament, one would turn red in the face at the fanciful notions that permeated India’s strategic discourses. The hubris was such that pundits blithely trusted the US to secure for India permanent membership of the United Nations Security Council and in due recognition of its status as a member of the “nuclear club” facilitate its induction into the Nuclear Suppliers Group [NSG] and other technology control regimes that are dominated by the US. The civil nuclear agreement is about to celebrate its fifth anniversary in the coming months and an honest reappraisal would show that the net benefit of that pact so far has been that it has become possible for India to source uranium supplies from friendly countries without the US blocking it so that its limited uranium deposits can be earmarked for weapons production. Does the US-India nuclear deal allow India to gain access to reprocessing technology? No way. What about India’s membership of the UN Security Council? No one talks about it. At the very least, what about the NSG membership? The above non-committal words betray attrition and a sense of fatalism. As a consequence of all this, perhaps, there has been a gradual and steady course correction lately. Meanwhile, in the recent period Pakistani and Chinese diplomacy has also reminded India of some home truths, which serve to underscore how sub-optimally Indian regional policies have been performing. In February, China took over the management control of the strategic but commercially troubled deep-sea port of Gwadar, near Pakistan’s border with Iran. In early March, the formal inauguration of the 1500-kiolmetre Iran-Pakistan gas pipeline project costing $7.5 billion took place. Much of the construction work is on the Iranian side of the border, which Tehran has completed and the construction on the Pakistani side at an estimated cost of $1.5 billion is due to begin shortly. Possibly, Russian or Chinese companies may participate in the construction work. And, it now transpires that sometime in mid-February, China and Pakistan also entered into an agreement to construct a third nuclear reactor at Chashma in the Pakistani province of Punjab. Each of these developments could be the stuff of a morality play from the Indian perspective. India has been a rare supporter of the US’s New Silk Road Initiative or NSRI (which the former US secretary of state Hillary Clinton first unveiled during a visit to India in July 2011). Whereas, Pakistan opted to work with the regional powers whom the NSRI sought to “contain,” sharing their misgivings about the raison d’etre of the US project. Again, China has made a smart move to position itself in Gwadar, reversing an earlier decision not to do so as that might upset Delhi unduly. It is a smart move insofar as it meshes with the Chinese philosophy of cooperation and competition with the US and is in sync with the “big picture” that China has kept in view for navigating the trajectory of its future relationships within the massive geopolitical space in its western neighborhood comprising Central Asia, Afghanistan, Iran and Pakistan. Gwadar enables China to access the Persian Gulf market through a much shorter route than via the Malacca Strait. At the same time if and when Afghanistan stabilizes, Gwadar becomes a Silk Route for the Central Asian market. The audacity of the Chinese move is such its commentators have coyly invited India too to avail of the transit route via Gwadar. The high probability is that in the fullness of time Gwadar may have use for the West as well for accessing the Central Asian region. As for Pakistan, it holds the key to the NSRI, which aims at countering the Russian influence in Central Asia. Without Pakistan’s cooperation, the NSRI is a non-starter. On the other hand, Pakistan can also act as a vital communication link between China and the Persian Gulf, between Central Asia and the world market, between Iran and China and between South Asia (including India) and Central Asia. It can have all of these options and it can cherry pick. No wonder China has offered to invest $500 million for the construction of the Iran-Pakistan gas pipeline (which is extendable to China) and Iran proposes to build a petrochemical complex in Gwadar. Of course, Washington has been threatening Islamabad with dire consequences if the latter proceeded with the gas pipeline project or cooperated with Iran in the oil sector. Although Pakistan depends on American assistance, it has chosen to ignore the US’s blackmail. In sum, Pakistan showed grit as an independent sovereign country. It worked tenaciously in the recent years to build a strategic partnership with Iran. The Pakistani and Iranian intelligence worked together to muzzle the Sunni terrorist organization Jundullah operating from bases in Afghanistan and strongholds within Pakistan to subvert Iran’s eastern Sistan-Baluchistan province. It helped improve the mutual trust in Pakistan-Iran ties. The point is, Pakistan too has a “big picture”. On the one hand, it cooperates with the US on the Afghan peace talks and it will remain an indispensible partner for the evacuation of American war equipment from Afghanistan, while on the other hand, it has harmonized with Iran to ensure that the two erstwhile rivals do not lock horns in the Hindu Kush once again by propping up proxies. Clearly, Pakistan has outmaneuvered India by foreclosing the possibility of the revival of an India-Iran strategic understanding built around anti-Taliban resistance as in the late 1990s. On the contrary, under US pressure, India mothballed its participation in the Iran-Pakistan-India gas pipeline project and further caved in to cut back oil imports from Iran (and might altogether terminate the imports altogether soon) so as to fall in line with the US’s sanctions regime against Iran. India is now pinning hopes that Washington will compensate by supplying it with LNG produced from its abundant shale gas reserves and some favorable response from Washington would be forthcoming at the US-India Strategic Dialogue slated for June in New Delhi. Equally, the China-Pakistan nuclear cooperation also raises some awkward questions. The China-Pakistan deal has been struck virtually under American nose but US has been either helpless or unwilling in preventing it. Besides, China has shown that where there is a will there is a way to advance the nuclear cooperation with its key regional ally – with or without the NSG’s green signal. Evidently, something has gone awry in India’s regional strategies. According to the recent reports, Indian government is scrambling with countermoves. It apparently hopes to resuscitate the moribund strategic partnership with Iran with two parallel moves by negotiating a transit pact for facilitating India’s trade with Afghanistan and Central Asia, and, secondly, by investing over $100 million in the expansion of Iran’s Chabahar port (adjacent to Gwadar), which could eventually be India’s gateway to the Central Asian and Eurasian space, including Russia. How much of this is for real and how much would be posturing aimed at creating negotiating space with the US, time will tell. 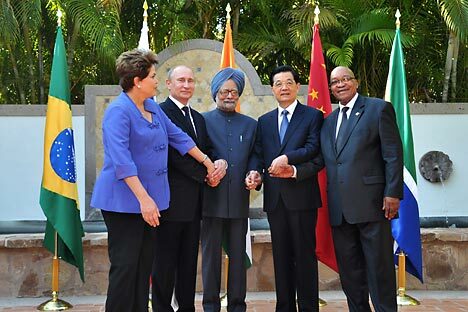 Yet, one feels tempted to call this India’s “BRICS moment.” The BRICS’ Durban summit on Tuesday and Wednesday will throw some light. The summit will show how far India is prepared to go in the new direction.